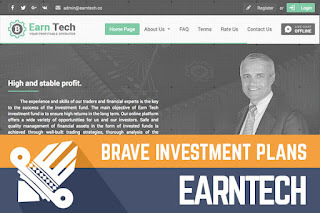 On 16th of September EarnTech joined Standard listing with $200 reinvestment. Project EarnTech only in past week have started broader advertising, but it is apparently warmed up well, and a lifetime of it is quite impressive - more than 50 days online. The administrator has his strategy, and it seems that it works out very well. One thing is for sure - project looks beautiful, and quality is placed in the first position, right before anything else. The administration has crafted something that feels good and with an incorporated company, green SSL bar, and other catchy nuances it appears like everything is for real. Of course for old players like us is it 's obvious it is just another HYIP, but nevertheless, I'm always thrilled to see something quality around between hundreds of other not that well-prepared programs. In the introduction, I said that administrator has his strategy and with that, I meant investment plans that this project is utilizing. Interesting that only one investment plan is accessible for regular investors like us and it is the one that pays 1.35% daily for 35 days. Sounds alright, but there is one limitation with this plan - you can have only one active deposit. You can invest again into this plan only after your deposit will expire. What does that mean for us - it is possible that this project will reach quite a great lifetime just because 1.35% daily is not very much, the project will grow gradually, and admin can easily pay such interest rate. Other investment plans start at $10 000+ minimum entry, and it is clear that such minimum deposit is not for everyone. Such project seems like a safe port in our fragile industry, and I believe that it is likely because I don't think that it will be that quick when someone deposits in those other investment plans were 10K+ is a minimal entry. Of course, it is no secret for us that someone will appear at some moment and deposit in those VIP plans as well, but I'm confident that at this time we can earn healthy and we will be able to earn in the future from this project as well. Of course, time will show how such strategy will work out for this project, but at this stage, I'm very, very optimistic because similar projects have been capable of being online for year or so. Overall I believe that administrator had chosen the right time when to start advertising and investing now would be relatively safe, of course, if you prefer investment plan that I mentioned earlier. Take in accountant that EarnTech is high-risk company and if you invest than only that you can afford to lose. Investment plans: 1.5% up to 2% daily for 35 up to 55 calendar days, initial deposit included in the payments. 225% up to 1000% after 35 up to 125 business days, initial deposit included in the payment. Did you ever try to automate your free BTC collections with a BTC FAUCET ROTATOR?